Dinner tonight at Rapa Nui, this is a new resturant where the old Sibu Café was in Kailu-Kona town. 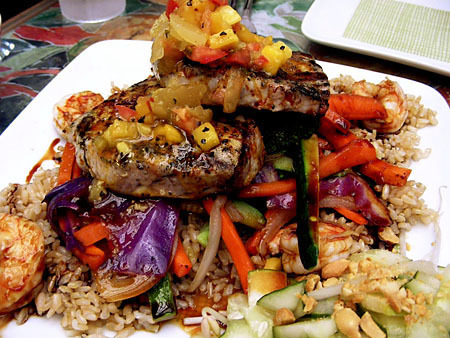 A seared ahi with shrimp, stir fry veggies and cucumber salad on a bed of brown rice. It was very ono (delicious) and I should have taken a photo of dessert, a banana, coconut wonton with fruit and vanilla ice cream but it was dug into before I thought of taking a shot. A good place to eat and I recommend it to anyone.